Rosalina's Ice World is the second race course of the Special Cup in Mario Kart 7. Located on an icy road, it is owned by Rosalina and based on the Super Mario Galaxy installments. The drivers can dive in water, where some Penguins swim, which strongly resembles the main planet of Cosmic Cove Galaxy. The track starts off in a snowy area with snow covered domes and the Comet Observatory off to the side. The racers then slight to the right and pass through a halfpipe-like area with the right edge as a pit and some coins. After entering a cavern, a small ramp allows racers to jump onto an icy area with penguins and a few coins, with the first lap giving them a choice of the icy path, or an underwater cavern filled with more coins than above. The second lap, however requires racers to go underwater unless they have a Mushroom, use the long mini-turbo, or drive straight after the curve (at least eight coins needed) and hold the Circle Pad down, as the kart goes higher when this is done. After the icy area, racers go through another cavern, but with icicles protruding from the ground, which can be shattered. The road then splits and gives the racer a choice of taking a narrow boost filled area, where a Starshroom can be seen on the right, or a wide path with no boosts. A final boost jump is then encountered and finally the racer turns to the finish line. 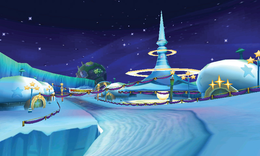 In the background of the course, the starting planet of the Gateway Galaxy can be seen in some areas. Mario landing in a pack of ice with snow-covered domes. Mario and Toad driving to the finish with a Blooper. The Gateway Galaxy's Starting Planet can be seen. This is the only race course to be owned by Rosalina. This is the only Nitro Course in Mario Kart 7 which does not involve gliding. This is the second Special Cup course to take place in a snow/ice-themed area, the first being Vanilla Lake 2 in Super Mario Kart. When racing online, the underwater penguins are absent. This page was last edited on January 2, 2019, at 22:06.